Dimenticatevi di combattere il traffico e cercate un parcheggio all'aeroporto internazionale del Cairo. Salta tutti i mal di testa associati con arrivare all'aeroporto e viaggiare con fiducia - e senza preoccupazioni - programmando un veicolo privato. 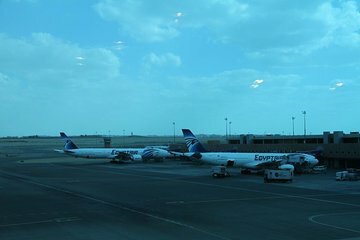 Siediti e rilassati mentre un autista professionista guida da qualsiasi alloggio Cairo o Giza per prendere tutte le partenze dell'aeroporto del Cairo 24 ore su 24, 7 giorni su 7. My driver was on time!!! Driver was waiting for us in the arrival hall and took us through the maze of the Cairo airport. He made sure we got our visa and assisted us with the bags. Drop off at the hotel. All appreciated given the long plane ride. Driver was there at specified time. Make sure to allow about 1 hour of Cairo traffic to get to the airport. Will use again. Super easy pick up and drop off, worry free. Highly Recommend it !! Driver was a little late but made up the time in the commute. I would definitely book thru Viator again in the future. Very nice. The guide Islam made sure we knew where to go and what to do once we were at the airport. Very helpful. Our guide Islam was fantastic. He really helped us on what to do and where to go when we arrived and departed. Highly recommend!